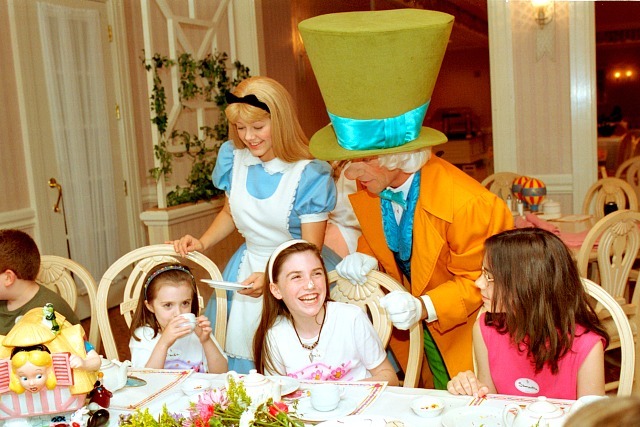 A Wonderland Tea Party at the Grand Floridian. Photo credit Disney. As wonderful as Walt Disney World is, it can be exhausting and overwhelming, which means you undoubtedly need some good old downtime. With all the parks and the kids running around having a blast, we forget that everyone could use some time to relax. We love staying at a Disney property like the Grand Floridian, so we can take time each day and get away. Downtime prevents melt downs, gives us more energy for our next adventure, and allows our family to just be together. 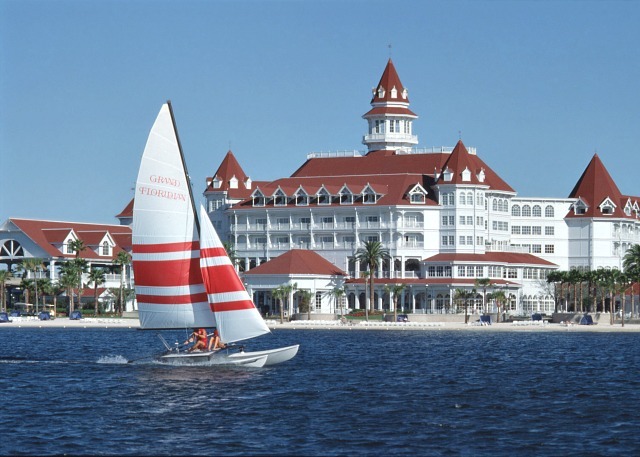 The splendor of the Grand Floridian Resort. Photo credit Disney. 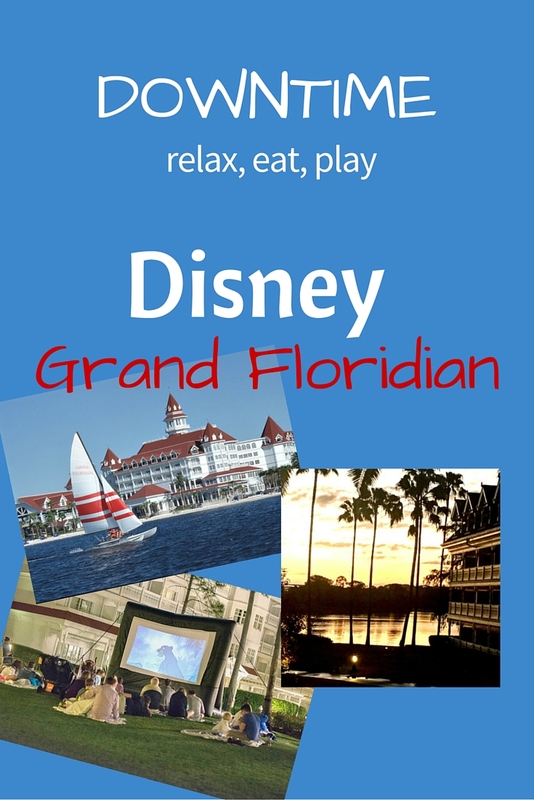 The Grand Floridian Resort is located in the middle of it all at Walt Disney World, making it easy to get to the parks and back with time to relax, so staying there makes planning downtime a snap. Just remember that you really need to plan your downtime in your schedule and make sure everyone you are traveling with knows when it’s time to chill. Make your reservations and make time for afternoon downtime tea. Take a break from the parks and enjoy high tea served English style. Located in a beautiful Garden View Tea Room, you can enjoy tea sandwiches, teas from around the world, and sweets especially designed for this occasion. High Tea is appropriate for the entire family and the little ones can enjoy a tea just for them, Mrs. Potts Tea. The sweets range from scones and pastries to specialty sweets created just for the Grand Tea. The room is small and peaceful and immediately brings a sense of calm. There are two pools at the Grand Floridian; the Courtyard and the Beach. The Courtyard Pool is in the center of the property and is great for a quick swim or to cool down. Centered in the middle of the hotel room buildings, it is perfect for a family meet up. The Beach Pool is located overlooking the Lagoon and the view is gorgeous. There is a water slide and water area for the younger kids, too. Turn it up a notch for downtime and rent one of the two cabana options for the day. Choose the standard which includes chairs, a TV, fridge stocked with water and sodas, towels, and more. These are great a family meeting places and who doesn’t want a dedicated shaded area in the hot Florida sunshine? Turn it up even more and rent a Poolside Palace. You’ll have all of the above, plus everything you could ever need. Just be sure you make a reservation ahead of time for the Poolside Palace. Trust me, it is well worth the both the expense and the time away from the parks. 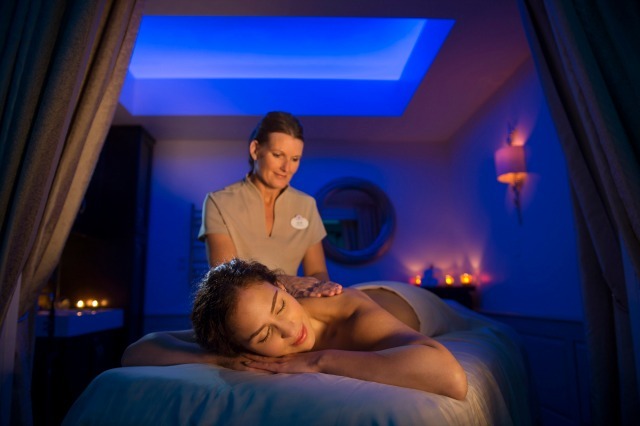 The Senses is the on-site spa at Disney’s Grand Floridian. It is a full-service spa where you can get a manicure or spend the entire day. From the time you check in until you leave, you will be in full relax mode. A comfy robe will greet you and the seating in the relaxation room is the sort of space where you never want to leave. No lie, I once fell asleep there. Enjoying a Senses spa treatment at the Grand Floridian. Photo credit Disney. 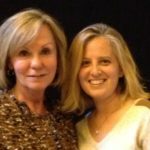 Let the kids go off to play on the private adventure or hire a sitter for a few hours and schedule some couple’s time at the spa for a special date. Or do you need a few hours of TLC? 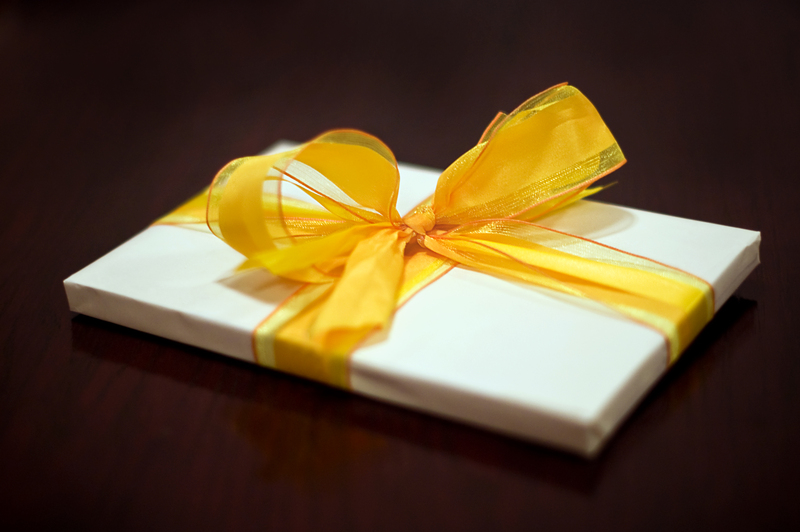 Book the Senses Signature package for a five hour adventure of mani, pedi, and massage. Another favorite is Me Time Magic that includes a pedicure, bath, massage, and facial. The spa also offers mani/pedis for your little ones, if you accompany them. This would be a special treat for some mommy/daughter downtime. The rooms at the Grand Floridian are a perfect place to hang out with the family. With ample space and a private balcony, your room can be your oasis. There are many different room types in the outer buildings and main building, plus one and two bedroom suites. Whether staying in a standard room or a suite, use your room as a place for downtime. With multiple Disney channel options and space for everyone, it makes for a comfy family space. Order breakfast in the room for a quiet start to the day or have cookies and milk when you get back; either way is wonderful for everyone to start the day or end the night. Use your balcony as well to enjoy coffee while watching the sun come up. We always travel with a few games and coloring books for the kids to be able to decompress as well. Using your room as your getaway is a must for a vacation packed with go, go, go. Plan to cozy up with the family at the Beach Pool for Movies under the Stars. Not every night needs to wrap up with roller coasters and late night dinners. Call it an early night and schedule time where you can relax with an earlier dinner and cuddle up together under the stars. The movies are always Disney and always enjoyed by the whole family. The best part is when the little ones fall asleep, you don’t have to carry them far to tuck them into bed. 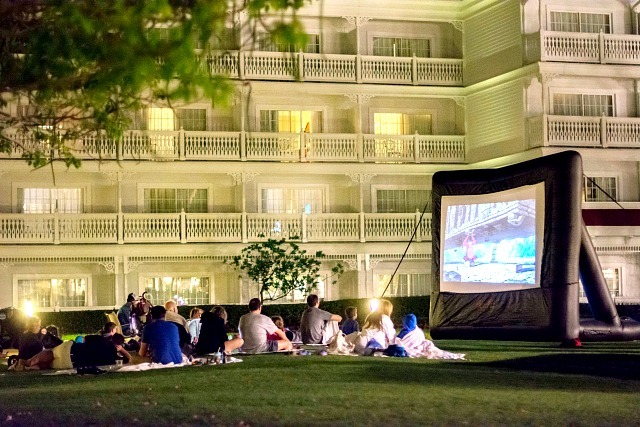 Movies under the stars at the Grand Floridian. Photo credit Jennifer Acocella. Sleep in and order room service. Hang out in the beautiful lobby. Book reservations at Victoria & Albert’s. Head out for some fishing with the family and a guide. Enjoy a low key evening with the family around the Grand Floridian Campfire. How will you plan your downtime at Walt Disney World’s Grand Floridian?